Goalie Semyon Varlamov is in his sixth NHL season and third with Colorado. With a 5-2 loss on Tuesday, the Colorado Avalanche suffered only their second regulation loss in their past 12 games and their first in seven games. 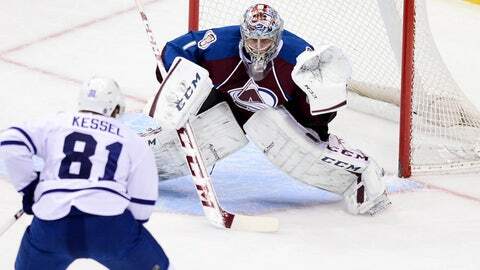 Entering Wednesday, the Avalanche had the sixth-best record in the NHL with only 32 games left in the season. At this point, they are a safe bet to make the playoffs for the first time since 2009-10. Colorado coach Patrick Roy said the season has exceeded his expectations thus far. "I didn’t really know what to expect early on," he said. "I watched the tape when I took the job in the summer. … I had a good idea what I wanted to do. I knew we were a young team but at the same time I mean how fast (first overall pick Nathan) MacKinnon could adapt to the league, (Matt Duchene) and Ryan (O’Reilly), we tried O’Reilly with Duchene on the same line, would that be successful? "There were a lot of question marks but at the same time everything seems to click well and I have to say the addition of guys like (defensemen Nick) Holden and (Nate) Guenin as a free agent we were not sure if they were going to make the team but not only did they make the team but they’re playing a big role in our success. And our goalie has been just phenomenal for us. He’s playing really well every night. That’s the reason we are where we are. Our best players have taken the lead, which is what you want as a coach." The goalie, Semyon Varlamov, deserves closer attention. His 24 wins are tied for third in the NHL and his .925 save percentage ranks eighth. Even when he turned himself in on Oct. 30 on charges of domestic violence — charges that were dropped less than two months later — Varlamov did not lose focus. Nashville coach Barry Trotz said he thinks Varlamov is having the type of season that his fellow Russian countryman Sergei Bobrovsky had last season when Bobrovsky won the Vezina Trophy for Columbus as the league’s top goalie. Trotz said Roy deserves credit for getting Colorado to play better defense. "He’s been outstanding," Trotz said of Varlamov. "To me, he’s been probably the best goalie and they still give up a lot of shots for a high-skill team" — Colorado ranks 25th in the league, allowing 31.9 shots per game — "but he’s difference-maker. When they’re not on their game, boy, he’s been good this year." Roy gave credit to Varlamov for working with new goalie coach Francois Allaire, one of the game’s goalie-coaching gurus, and for his hard work. Roy said Varlamov has stolen games for the Avs while rarely having an off night. Nonetheless, Roy, who won the Vezina three times in his career, tried to discourage any trophy talk. "I don’t agree with this because Vezina — it’s a word I don’t want to say and I don’t want to hear about," Roy said. "We said something very interesting at the beginning of the year: We’re always going to stay in the present world. We’re not going to be low after a loss, too high after wins. At the same time, we just want to be even keel. Vezina, Hart, Masteron or whatever the trophy — could be Stanley Cup — it’s a result. "We want to make sure we play hard every night and we reset every night that’s what I suggest to Varly after every game. Don’t pay attention to what people will say." For now, it’s a formula that keeps working for the Avs. The Washington Capitals might have the league’s leading goal scorer in Alex Ovechkin but lately they’ve hardly been able to light the lamp. Ovechkin has 35 goals on the season and continues to score at a pretty good clip — he has three goals in his past five games while sitting out on Tuesday with a lower-body injury that appears to be day-to-day — but that hasn’t stopped Washington from going winless in its past six (0-4-2) and falling out of the top eight in the Eastern Conference. The Capitals have 52 points, two fewer than surging Columbus for the eighth and final playoff spot in the East. Washington has played one more game than the Blue Jackets. In five of their losses during their current streak, the Capitals have scored one goal or no goals at all. They also lost to Pittsburgh 4-3 in a game in which they led in the third period. Washington’s scoring woes have exposed larger issues. For one, their ROW — regulation and overtime wins, the statistic that is used as a tiebreaker come playoff time — ranks among the worst in the league. The Capitals have only 14 regulation and overtime wins, placing them eighth among eight teams in the Metropolitan Division. Not surprisingly, the Capitals’ eight shootout wins are tied for second-best in the league. The issue is that lately the Capitals’ luck in shootouts has run out. Shootout losses to Buffalo and San Jose back on Jan. 12 and 14 started the Capitals’ winless streak. For a time, rookie goalie Philipp Grubauer was carrying the Capitals but they sent him back to Hershey of the American Hockey League on Monday after he was pulled in consecutive outings. He has a 6-4-5 record — note all of those overtime or shootout losses — but his goals-against average (2.38) and save percentage (.926) still remains the best among the three goalies Washington has used this season. Grubauer was winless in his final four decisions before going down. "We’re in a slump right now, that’s for sure," center Nicklas Backstrom told The Washington Post after a 4-1 loss to the New York Rangers on Sunday. "It’s tough, but we’ve got to find a way to get through it. We’ve got to start playing way better than we do right now. We’ve got to find a way to play good every night. That’s the expectations we should have on ourselves every night." Otherwise, the Capitals will end up underachieving, as they have done too often in recent seasons. 1. Anaheim: Up-and-down week for the Ducks: They set a franchise record for goals with nine against Vancouver last Wednesday, then suffered their first home regulation loss of the season to Winnipeg on Tuesday. 2. Chicago: With a plus-25 rating (tied for NHL’s best), right wing Marian Hossa is showing he is still one of the league’s top two-way forwards. 3. St. Louis: The Blues took a rare beating on Tuesday, 7-1 at the hands of New Jersey. The game was played despite a blizzard in Newark. 4. Pittsburgh: Chris Kunitz’s 11 power-play goals rank second in the league. 5. San Jose: The Sharks have rebounded from a mini-slump in which they lost four of seven to win four straight. 26. Florida: Rookie Aleksander Barkov, the second overall pick at the 2013 NHL Draft, leads the team with 24 points. 27. New York Islanders: Isles are 7-3 in their past 10 but still sit seven points out the final playoff spot in the East. 28. Calgary: Flames have an 18-point gap between their leading scorer, Jiri Hudler, and their No. 2, defenseman Mark Giordano, 40-22. 29. Edmonton: Forward Matt Hendricks, who was traded by the Predators last week to the Oilers, paid for 150 tickets for military families in Nashville at a game on Monday. 30. Buffalo: The Sabres trail No. 29 Edmonton by only three points, the closest that gap has been in a while. Anaheim at Los Angeles, Saturday, Dodgers Stadium, 9:30 p.m. Eastern. The NHL’s "Stadium Series" begins this weekend with the first outdoor game in California. Call it a miracle of technology — the high is forecast for 80 degrees with a low of 52 and a zero percent chance of rain, the greatest danger of all to ice — and just as the Winter Classic has proved a feast for the eyes, so should this one. We won’t have the snowscapes of Buffalo or Ann Arbor. Instead, get ready for the possible sight of fans in beach garb. The league had excellent timing with this game, as these two archrivals are having great years. The Ducks, despite two regulation losses in its past three games, own the best record in the league while the Kings are eighth-best overall. Kings goalie Jonathan Quick has mostly played well since returning from a long bout with injury — he’s 4-2-2 since — while Ducks goalie Jonas Hiller had won 14 straight, tied for the second-longest streak in league history, but has now lost two straight. Each will likely start in goal for his respective Olympic team next month, the United States for Quick and Switzerland for Hiller. Despite plenty of top offensive players on each side, the goalies could be the ones to watch.